Ketamine for Depression: How does it work? We ran across a useful review of the basic science literature in an interview of David Nichols on the Psych Congress Network. 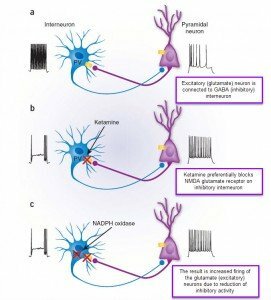 Although ketamine blocks the NMDA subtype of glutamate receptors (blocks an excitatory neurotransmitter) the net effect seems to be an increase in excitatory neurotransmission. This image from Nature may help to explain this effect. 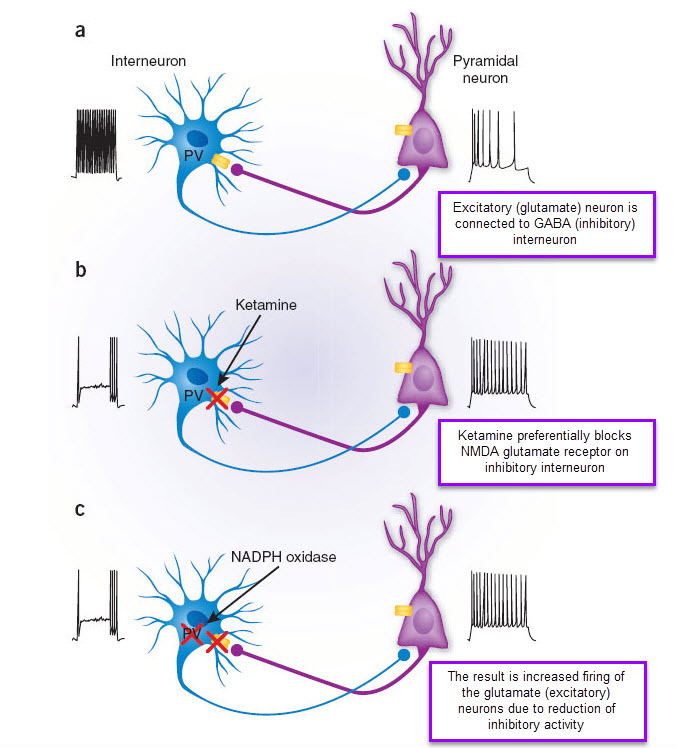 In essence, ketamine preferentially blocks the NMDA receptors on inhibitory interneurons (neurons that regulate the activity of the glutamate system). By blocking the inhibitory interneuron activity the net effect is an increase in glutamate activity. But does the increase in excitatory neurotransmission explain the effects on depression? Probably not. After all, agents that increase glutamate activity usually increase anxiety, and trigger seizures, but haven’t generally been shown to reduce depression. Ketamine also is associated with a rapid increase in brain derived neurotrophic factor (BDNF). Lisa Monteggia and Ege Kavalali of the University of Texas Southwestern Medical Center conducted a series of experiments looking at ketamine’s mechanism of action that were published in Nature on June 15, 2011. 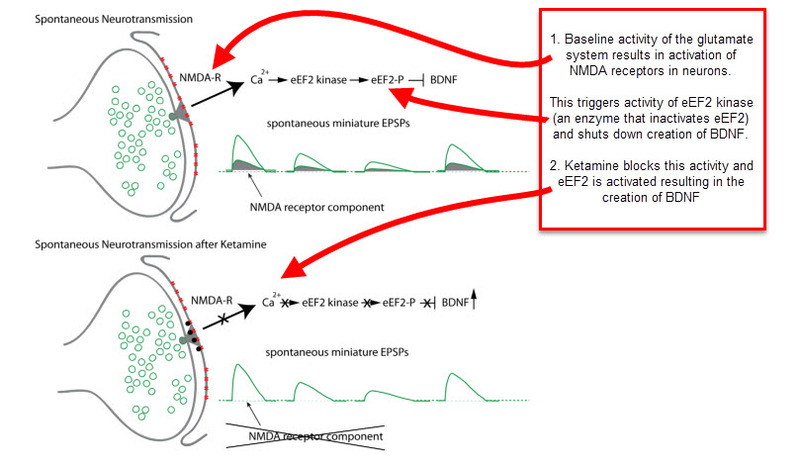 Mice genetically engineered to lack BDNF did not have an antidepressant response to ketamine. 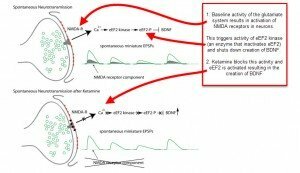 They discovered that ketamine’s blockade of NMDA receptors leads to the activation of a protein called elongation factor 2 (eEF2), which helps to create more BDNF protein. Elongation factor 2 is an essential regulator of protein synthesis in general, and plays a particularly important role in determining levels of BDNF in the brain. The way that NMDA activity affects BDNF levels is illustrated in the picture to the right which is derived from an article Lisa Monteggia in Biological Psychiatry (2013). When they used enzyme inhibitors to manipulate this pathway directly and boost BDNF protein levels, they saw antidepressant-like effects similar to those seen with ketamine.